Completed in November 2011, the RIBA Award winning £28million Exhibition Road redevelopment project has transformed one of London’s most visited streets into one of the most accessible cultural destinations in the world. It is one of London’s most high profile streets, being home to leading cultural and academic institutions such as the Natural History Museum and Imperial College, but over time had become inefficient, being dominated by traffic with narrow, crowded pavements and street clutter, and was unable to handle the millions of people who visit every year. A complete redesign was needed to improve infrastructure and access to facilities. The winning design’s vision was a complete overhaul of the street, creating a ‘shared space’, which means that pedestrians and vehicles co-exist without one being the dominant force. This is created by the removal of kerbs, pavements and other obstructions, this encourages motorists to slow down and engage with the pedestrians creating a safer and more secure environment for all. Marshalls was approached in 2010 to supply a range of key physical features of the redevelopment; natural stone, bespoke street lighting, drainage solutions and street furniture. Marshalls worked with Dixon Jones and contractors Balfour Beatty to supply the 22,000m2 of Yorkstone paving and Granite setts banded in black and pink, which create the diagrid crisscross paving pattern giving the street its unique visual identity. 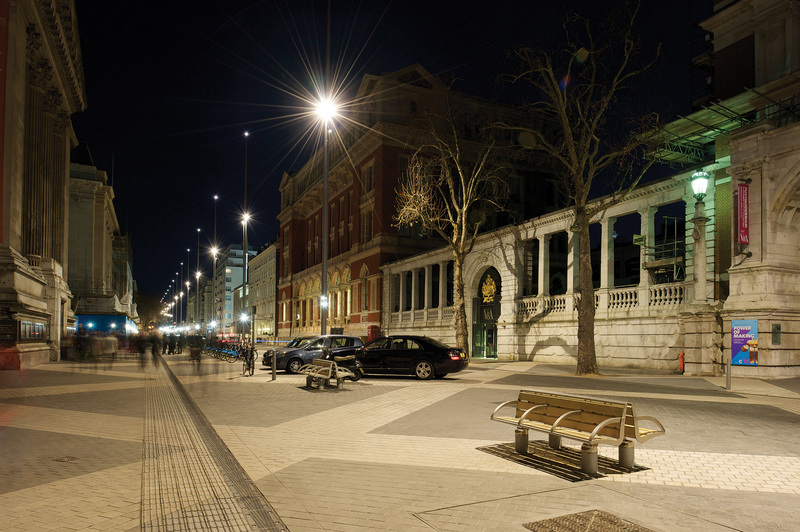 The Marshalls water management team worked with Balfour Beatty to design and supply the street’s drainage solutions; on Exhibition Road this is provided by two continuous linear drainage channels, and includes bespoke cast iron tops. Woodhouse, part of the Marshalls PLC group, worked closely with the client and landscape architect to design and supply a new multifunction street lighting concept to create, engineer and manufacture a distinctive yet functional lighting solution; 28 bespoke tapering 20m steel lighting masts which define the centre of the carriageway, and which also coordinate with the Woodhouse Geo street furniture range. The finished result makes Exhibition Road one of the most striking thoroughfares in London. The paving’s diamond shape pattern, as well as visually appealing, naturally leads users across the street from one famous cultural centre to another. The clutter free environment feels calm, and allows crowds to flow more freely over the paving allowing for easy passage from South Kensington tube station to the museums which line the famous road. The bespoke Woodhouse lighting masts enhance the appearance of the streetscapes many colours, textures and finishes, and give pedestrians the feeling of added security. Mayor of London, Boris Johnson, said: ‘This clever approach to rearranging the streetscape at the heart of one of the most important cultural and academic corners on the planet will heighten the whole experience for visitors. ‘In particular it will make it much easier and even more pleasurable for families visiting these unique attractions with space to wander unhindered in an area that puts people first.